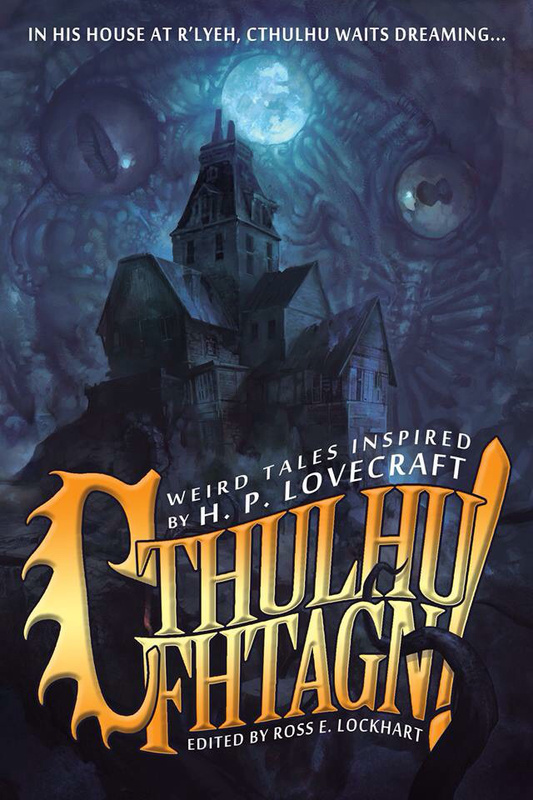 One of my favorite anthologies of 2015 was Cthulhu Fhtagn!, edited by Ross E. Lockhart and published by Word Horde. The one requires a disclaimer, as my story “Delirium Sings at the Maelstrom Window” appears, but I’m talking about the rest of the book. Let’s pretend my own story isn’t involved. Many different styles and moods are in the mix here, in a great cross-section of weird, horrific, funny and dark. My own personal favorites were the last two stories in the book: the aggressively strange and sublime insanity of Cody Goodfellow’s “Green Revolution,” a story of ecology and science gone wrong, and Laird Barron’s “Don’t Make Me Assume My Ultimate Form,” in which the incredible Jessica Mace makes another appearance, and we meet a most interesting cast of characters, including Mrs. Shrike. If you’re interested in a free sample of one of the stories included, Scott R. Jones made an audio reading of his story “Assemblage Point,” available HERE. And if you’d like another taste, I’m almost finished editing an audio reading of my own story, which should be available soon. When it’s ready, I’ll post a link here, of course, and you might also find it via Word Horde. Overall, Cthulhu Fhtagn! is an enjoyable and varied book, and really deserved more attention than it’s received so far. In my opinion, it’s one of the overlooked anthologies of last year (though it did win “Anthology of the Year” in the latest This is Horror Awards). I hope more people will check it out. I didn’t publish much more in 2015 than in 2014 or 2013, but I wrote a lot more. A couple of stories that were supposed to appear in 2015 were pushed back by the publishers to 2016 (see next year’s activity, below). “I’m Looking for Nick Cowan or Cody Steele” in The Doom That Came to Providence, edited by Joseph S. Pulver Sr.
“Miles and Cathrine at the Crimson” from Leaves of a Necronomicon, edited by Joseph S. Pulver Sr.
“Endure Within a Dying Frame” was accepted by the new editors of Lovecraft eZine and should appear there this year. My story collection, THE LURE OF DEVOURING LIGHT, will appear in 2016. I hope to have more specific information to announce soon. My guess is that by the end of 2016, the biggest event in my writing/publishing year will be the this book. I also finished a short novel this year, and it’s on submission, so it’s my hope that this may become a publishing news item in 2016. As I write this, I’m in the middle of writing stories for four anthology invitations (two finished and submitted, the third just underway, and the fourth to write in Jan-Feb), then I intend to get started on some other projects. I have an unpublished short story I’d like to revise and extend into a novelette for an interesting small press that publishes some great limited editions. The bulk of the year will be taken up with two planned novels. I’d like to write both in 2016 if I can manage it. At the very least, I’ll finish my first full-length novel and start another. I recently posted video of my reading from “Firedancing” in The Children of Old Leech at BizarroCon. Link HERE. A few days after that reading, several Portland writers who all happened to appear in Word Horde’s anthology CTHULHU FHTAGN! had a group reading at Powell’s Books, the SE Hawthorne location. My thanks to Nathan Carson (who also read) for setting up the reading event, and also to Ross E. Lockhart for publishing Cthulhu Fhtagn! and selecting my story for inclusion. You can order a copy of the book at Word Horde. With such anticipation of the run-up to NecronomiCon Providence (see prior entry), I failed to note an important event… the release of CTHULHU FHTAGN! by Word Horde Press. Editor Ross E. Lockhart is the man who brought the world The Book of Cthulhu and Book of Cthulhu 2, two of the great Lovecraftian anthologies of the past decade or so. I’ve started reading CTHULHU FHTAGN! and I’m really enjoying it so far. Lots of variety, very different approaches to the subject. It’s a real honor, and a very exciting occasion, to be part of this book. Editor and Publisher Ross E. Lockhart of Word Horde has published the full Table of Contents of his upcoming anthology CTHULHU FHTAGN! Also note, the exclamation point is part of the title, not just my excitement about this book. This promises to be a great one. I’m excited to be part of another Word Horde book, and also to share a Table of Contents with so many great writers — some for the first time, others for the second or third time. I’ll Be in Cthulhu Fhtagn! In 2014, I had a story in the 2nd Word Horde anthology, the Laird Barron tribute The Children of Old Leech. This made me very happy, as I’m a huge fan of Laird’s writing. My story “Firedancing” remains one of my own favorites, and was even called out in a number of reviews of the book. I’m happy to report that I’ll have a story in the 4th Word Horde anthology, Cthulhu Fhtagn! edited by Ross E. Lockhart. My story is called “Delirium Sings at the Maelstrom Window” and is a sort of present-day sequel to “The Music of Erich Zann.” Despite this connection to Lovecraft’s story, it still very much has the feel of my work, and will probably annoy some Lovecraft fans. The cover hasn’t been revealed yet, and I don’t know the full table of contents, but quite a few great writers announced their participation this week, including: Anya Martin, Orrin Grey, Ted E. Grau, Scott R. Jones, Nathan Carson, Wendy Wagner, Molly Tanzer & Jesse Bullington. I’ll post more information as soon as I can. This should be an excellent project, and I’m very excited to have a part in it.